Expectations were low going into the Hungarian Grand Prix, but the thought of rain may have peaked a few interests. The shower came before the start of the race but still affected tyre choice and the first half of the Grand Prix. There were a handful of safety cars, several accidents, and a fight for the win right until the very last few laps. If you missed any of the action, and let's face it, that's not hard to do in a chaotic afternoon like this one, then read on through the Factbyte Factbox replay for lap by lap coverage of the Hungarian Grand Prix. Hi F1 fans, welcome to the Factbyte Factbox for the Hungarian Grand Prix. It's all about the rain! There's been a downpour already, with just half an hour until the race is due to get underway. This is the moment the pit lane opens and the cars leave the garage to head towards the grid, they'll need to be careful on the slippery track! The big news in terms of the championship was Lewis Hamilton failing to qualify yesterday. His Mercedes caught fire in the first session, meaning he couldn't set a time. After a big patch up job, the car will start from the pit lane, behind Kevin Magnussen (who crashed into the wall in what was a hectic qualifying). As cars start making their way to the grid, conditions look like they're clearing slightly. The track is damp but the rain has stopped for now, and the big showers are moving away from the circuit. There's a mixture of tyres on the cars going out to the grid. Nico Rosberg headed out on full wets, whilst Sebastian Vettel has done an out lap on both the wets and the intermediates, in case he needs to make a choice later. Pastor Maldonado has the blue sidewalled full wets on but has still managed to go wide off track and travel across the grass. Jenson Button: "Very slippery. It’s like a slippery thing out there. It’s so weird, the problem is it’s such a big rain shower, there’s loads of standing water. Even though there’s a high temperature here, you’ll get bits drying very quickly and bits that are still lakes. It’s quite warm, it’s not raining and it doesn’t look too bad here, but there are massive rivers. It could be tricky. The start line isn’t that wet but the rest of the circuit is. Turn one, as you head down, there’s lots of standing water." Kimi Räikkönen starts from 16th on the grid, sandwiched between Jules Bianchi and Kamui Kobayashi. The Finn didn't have any mechanical trouble yesterday but found himself dropping out of the fight after the track got quicker and quicker. Kevin Magnussen has already made his way to the end of the pit lane, securing his spot at the start of the pit lane fight. Lewis Hamilton is still tucked away in the garage, he's not in the car yet as the mechanics do their best to keep the car nice and warm in the damp conditions. Radar says the next rain shower should hit the track in about twenty minutes. Tweet from @Lotus_F1Team: Track drying quickly thanks to the warm Tarmac, everyone to start on inters? Sutil's radio confirms that all cars are starting on intermediate tyres. The tyre blankets come off and the mechanics clear the grid. Nico Rosberg peels away from the grid to start the installation lap. Sebastian Vettel, alongside him, is anxious to get away. Daniil Kvyat doesn't get away from the grid, though. "I have no engine, just went off," he reports. Lewis Hamilton's Mercedes is out of the garage now, tyre blankets still on to keep warm for as long as possible. Nico Rosberg pulls to a halt on the grid. Kvyat's car has been recovered to the pit lane. A great getaway for the first three drivers, as the spray kicks up behind Rosberg. Vettel loses a place as Bottas goes around the outside at the first corner. Vettel falls back into the clutches of Fernando Alonso too, who manages to move up to third at the very next corner. Lewis Hamilton has spun off track into the gravel, but he gets the car going again with dirty and cold tyres. Vettel has managed to get back ahead of Alonso for third place. Team radio from Lewis Hamilton: "I hit the wall, I think. Just check my wing and everything. The brakes just gave up." Daniil Kvyat did get going, he's last of the runners, with Hamilton just ahead of him. Jenson Button has moved up a couple of places to fifth, with Daniel Ricciardo losing out in the first couple of laps. Nico Hülkenberg also has improved on his starting place, currently sitting 7th. As Nico Rosberg crosses the line to start the third lap, the spray down the home straight is still huge and slowing into the first corner looks treacherous. Kimi Räikkönen is up to 13th, having started 16th on the grid. Behind him, Romain Grosjean and Jules Bianchi have retained their starting positions. Replays of Hamilton's spin show the car just spun out from beneath him, he tapped the wall gently but it was enough to dislodge the front wing endplate. Team radio to Jean-Éric Vergne: "Very important to look after the tyres, maybe more rain coming soon." Hamilton has complained about vibrations on the car, but is still making his way through the field. He's up to 15th and sitting behind Romain Grosjean now. Cars are still slipping and sliding off track occasionally. Hülkenberg, Maldonado, Hamilton and Räikkönen have all had brief excursions offline. There's a dry line appearing, but with rain on the cards, the drivers are desperate to keep these intermediates alive for as long as possible. It's not easy, even for Nico Rosberg, who runs off track at turn one, the dampest part of the track. Kvyat reckons it will just be three or four laps before the track dries. Another bit of Hamilton's front wing has fallen off, but he passes Kimi Räikkönen for 13th place down the home straight. Marcus Ericsson's Caterham is in pieces at the side of the track. The safety car is deployed, and the medical car overtakes the safety car to hurry to the scene of the crash. All the drivers head into the pit lane to make the most of this safety car period. This will take some unravelling later. Marcus Ericsson is out of the car safely, walking away from the scene and unbuckling his helmet. Esteban Gutiérrez and Sergio Pérez are side by side out of the pit lane, both on the dry soft tyres. They're both wobbling like crazy, but it's Pérez that gets ahead in the end. Replays of Ericsson show he just lost the back end, it spun left, right and then hit the barriers with big damage. Jenson Button's pit stop ended in what could be an unsafe release, as the team waited for a couple of cars and then let him out alongside another. It's tough when there's a stream of cars diving in and out of the pit lane. The top four had already passed the pit lane entry when the safety car was called, so they had to do an extra lap before coming in. Thus now, Ricciardo leads with Button and Massa behind. Kevin Magnussen is fourth but he's the only driver not to have stopped yet. Button has gambled on the intermediate tyres, and is quickly on the radio asking if the rain is actually coming. Bottas has gone from second to eleventh place in that reshuffle, that was a major disaster for the Finn. Romain Grosjean has also crashed, so the safety car is likely to remain out for another lap or two. It's on the other side of the track from Ericsson's crash, but appears to be a similar incident. Much damage after a barrier collision. Rosberg's rear left is smoking, it may be something rubbing against the brakes. He asks if he should stop using the brakes, which seems like a dangerous thing to do! Grosjean is out of the car, standing with hands on hips at the side of the track. He must be wondering where it's all gone wrong this year. Replays of Grosjean's accident show he just spun out and hit the tyre barriers head on. Team radio to Kamui Kobayashi: "We intend to do 25 laps on this set, we don't expect any more rain for half an hour." Button is questioning the decision to be on the intermediates now, but the team are encouraging him to stay out. Their radar suggests rain, but clearly Caterham's says otherwise. Grosjean's Lotus is being hauled away now, the track is almost clear so barring anyone else getting up close and personal with the barriers, we should be racing again momentarily. Ricciardo gets a good exit out of the final corner to sweep down the home straight, but Jenson Button is right up behind him. And now ahead of him, he gets better grip at that damp turn one, and is in the lead. Team radio to Jenson Button: "Rain looking less likely, so we should push." Kevin Magnussen also manages to get past Nico Rosberg, as he's also on the intermediates and can make the most of it... for now. Lewis Hamilton is up to ninth place, but has Sebastian Vettel ahead of him. He takes a look down the inside but can't make it stick yet. Button reports he's got one more lap on these tyres, and then he'll need to change. Nico Rosberg tried to attack Magnussen to retake that position, but lost out and has now dropped back into the clutches of Vettel and teammate Hamilton. Hamilton is looking really feisty in the corners, close behind Vettel as they squabble for position. Button dives into the pit lane, handing the lead to Daniel Ricciardo. Rosberg outbrakes Vergne to move up to fifth place, he's keeping ahead of the Red Bull and other Mercedes for now. Yellow flags as Nico Hülkenberg has stopped at turn 14. Magnussen also came in for a change of rubber, and the two McLarens are now 18th and 19th - last of the runners. Replays show it wasn't just a stopped car for Hülkenberg, he tried to move past his teammate but collides with the back of Pérez and goes off. Somehow Sergio keeps going. Also, a lap earlier, it looks like Pérez lost some of his front wing at turn one. What's left of that Force India is still running in eighth place though. DRS has been enabled once more, and the racing is back in action. 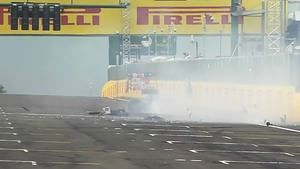 Replays show Pastor Maldonado and Jules Bianchi collided. They've both been into the pits for damage control, and are now back on track together. When the four cars didn't pit, Alonso was fourth and could have pitted but Ferrari chose not to. He's up in third, at the moment, so it hasn't worked out too badly for him. The Spaniard has also just set the fastest lap of the race so far. Tweet from @Marussia_F1Team: Lap 18/70 | Right rear puncture but all else seems okay. "We can get this back Jules" says his engineer. Hamilton isn't making much headway on Vettel, it has to be said. They've both got the benefit of DRS, so that is negated. It's allowing Rosberg to start eking out a gap in fifth. Team radio to Lewis Hamilton: "Front left brake is starting to get hot, we just need to manage these temps." Hamilton tries to take the inside line but has to pull back. Alongside down the next straight, and again he has to fall back. Tweet from @MercedesAMGF1: Where did @JeanEricVergne pop up into P4 from?! We've totally lost what's happening here - hats off to you though JEV! It's odd what's happening to the Mercedes pair at the moment. Rosberg was pulling out such a gap in the early stages of the race, but now after the pit stop and in traffic, he's got nothing to take the fight to Vergne... a Toro Rosso. Sergio Pérez crashes into the pit wall on the home straight. Safety car deployed yet again, there is debris strewn across the track. The Mexican climbs from the car and gives a half-hearted wave to the fans, he's okay but disappointed. Double DNF for Force India. Ricciardo and the two Williams drivers have both come in for another pit stop. Fernando Alonso moves into the lead of the race, with Vergne and Rosberg behind. Tweet from @MauriceHamilton: PER out of badly damaged car. 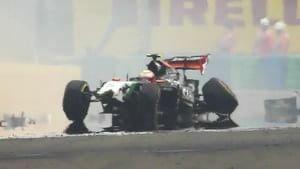 Bad day for Force India in crucial battle with McLaren. Team radio from Nico Rosberg: "Tell Charlie he needs to check if people were lifting on the straight past the accident, because they seemed to be going flat out past the accident. Especially the Toro Rosso in front of me, he was going flat out." Kamui Kobayashi has stopped, the Caterham out of the race and stationary at turn 12. The two Williams drivers have gone on to the medium tyres, which is an odd move as they don't need to use both compounds having run wets. Alonso gets a decent restart, and there's not much change behind, although Sebastian Vettel is still looking uncertain in a Mercedes sandwich. Two Sauber drivers into the points at the moment. Kimi Räikkönen also doing well after a tricky starting spot. Vergne's coming under pressure from Rosberg now, with Hamilton chasing down Vettel behind. Jenson Button sweeps past Adrian Sutil and also gets past Esteban Gutiérrez. The second Sauber is drastically falling down the order, perhaps his tyres have given up. Daniil Kvyat has pitted, and the Toro Rosso driver has also taken on the medium compound. Rosberg comes into the pit lane, although is instructed not to do so if Vergne did. The Toro Rosso stayed out, so Nico comes in for an almost 5 second stop. At the same time, Sebastian Vettel swiped against the pit wall, just like Pérez although with slightly less damage. The Red Bull driver continues but released Hamilton. Replays show he ran wide at the final corner, swung round in a circle and just managed to avoid the wall in a very lucky escape. Very worn tyres though. Hamilton sets the fastest lap of the race and is now challenging Vergne. The pair are tussling through several corners, Lewis diving this way and that to try and make the move. He goes round the outside of turn four and takes the place. Up to second for Lewis Hamilton. Nico Rosberg is down to 12th after his pit stop, finding himself behind Pastor Maldonado. He's ahead of Sebastian Vettel who has been into the pits for a fresh set of rubber after epic flat spotting during his home straight incident. Only halfway through this race. Don't know about anyone else, but I'm exhausted! Hamilton reports parts of his seat are getting quite hot. Ricciardo sets the fastest lap of the race so far, sitting in third place and just a couple of seconds behind Lewis Hamilton. Both are gradually reeling in race leader Fernando Alonso. After falling down the order, Esteban Gutiérrez returned to the pit lane and retired from the race - it looks like an energy recovery issue for the Sauber driver. Nico Rosberg pulls alongside Valtteri Bottas, and ends up pushing the Williams driver right off track. Nico moves up to 8th with Bottas 9th. Fernando Alonso pits, as Hamilton reports he can do another couple of laps at this pace. Alonso has put on the softer compound and rejoins back in fifth place. That puts Lewis Hamilton into the lead of the race, although he's due a pit stop very soon. There are dark clouds building above the track again. Lewis Hamilton pits, it's a relatively slow stop for the race leader, and he rejoins in fifth place, behind Alonso but crucially ahead of Rosberg. The two Mercedes drivers are on different compounds, with Hamilton taking on the mediums and Rosberg running pretty on softs. Daniel Ricciardo is back in the lead of the race, with Felipe Massa following. Kimi Räikkönen is third at the moment, although the Ferrari driver has only stopped once so far. Replays show Sebastian Vettel squeezing his way past Jean-Éric Vergne for ninth place. The Toro Rosso driver is clinging onto the points for now. Kimi comes in for his stop, it's a nice smooth turnaround for the Finn and he's out behind Pastor Maldonado, just ahead of Sebastian Vettel. However, the Ferrari and Red Bull go side by side through corner after corner. Vettel dives to one side of the Ferrari to attempt a move but can't do it, and then he runs wide and settles in behind. Ricciardo reports some kind of energy recovery failure, and is instructed a mode that might help to rectify it. Pastor Maldonado pits from 7th place and drops back down to 14th. Tweet from @pirellisport: There's a lot of different strategies at play though, with a more or less equal balance between cars on soft and medium tyres now. Massa reports that his tyres are starting to go away and that he is losing a bit of pace. The Williams mechanics ready themselves for an approaching car, and it's Felipe Massa who pits from second place. Hamilton reports on the radio that his seat is still getting hot and it's the same feeling he had in Montreal. Tweet from @fergieweather: Storm outflow to NE has caused change of wind direction. But no rain is imminent, despite dark skies. Lewis is now instructed that his teammate has one more stop on the cards, whilst he isn't planning to come in again, so "don't hold him up." Daniel Ricciardo has a good lead at the moment, with 15 seconds over Fernando Alonso. Hamilton worries over the radio whether his tyres will actually last to the end of the race or not, but the pit wall sound very calm about it. There's no sign of him letting Nico through yet, although there's no sign of Rosberg actually catching him yet. Tweet from @Ericsson_Marcus: "Just to let u all know I'm fine after the crash. Feel sorry for the guys @CaterhamF1 after all their hard work. A shame to end the race like that since the car felt a lot better today. Now we will recharge in the summerbreak and come back stronger for SPA." "Why's he not letting me through?" Nico asks. Hamilton gets more radio traffic to let his teammate through on the home straight, but there's still no change of position as yet. Nico still doesn't look close enough, really. Felipe Massa locks up with a stream of tyre smoke pouring behind him. Kimi Räikkönen is hunting the Williams down for sixth place. The two Marussia drivers are the only ones to have been lapped so far. Jules Bianchi currently leads teammate Max Chilton, 15th and 16th. Daniel Ricciardo airs some concerns about his rear tyres over the radio. He's leading with a 13 second gap over Fernando Alonso at the moment. Team radio from Daniel Ricciardo: "I'm not sure how much longer the rears can hang on." And thus, Daniel Ricciardo dives into the pit lane for a fresh set of final tyres. Fernando Alonso moves into the lead, with the Mercedes battle just a couple of seconds down the road behind him. The Red Bull driver rejoined in fourth place, and now has fresh rubber to chase down the three drivers in front. Teammate Sebastian Vettel suggests he will stay out to see what he can recover from his earlier spin. The battle is still on between Räikkönen and Massa, the pair fighting for sixth place. Nico Rosberg pits and rejoins all the way down in 7th place, just behind that battle between Massa and Räikkönen. Rosberg is told to push flat out now, qualifying style laps every single lap until the end of the race. Daniel Ricciardo sets the fastest lap of the race so far, a 1:26.783, as he chases down Hamilton. There's a great battle brewing behind Valtteri Bottas, with his teammate just a second behind. Räikkönen is only four tenths behind Massa, with Rosberg only two tenths behind the Ferrari. Bottas ducks out of the lead of that fight, taking to the pit lane for a late stop. Into the first corner, Räikkönen got caught up behind Massa and allowed Rosberg through. Nico Rosberg pulls to the side of Felipe Massa, into the home straight and he makes it look easy as he moves into fourth place. Over 20 seconds to chase down Daniel Ricciardo now. The gap between the top three is now down to just one second. And with nine laps remaining, there's time for anything to happen here. At the rear of the pack, there's another inter-team fight going on. Max Chilton is chasing down Jules Bianchi, who is nursing home a damaged car after contact with Pastor Maldonado. Fernando Alonso runs wide at one corner, not losing or gaining anything really. Replays show he just overcooked it into the chicane. He lifts a little to try and make sure he's not accused of gaining anything. Hamilton locks up into the first corner, as he complains over the radio about the advantage Alonso must have gained in that chicane-miss. The gap is slightly closer for Ricciardo to Hamilton, than Lewis to Fernando. But blink and it could all change round. A tense three-way battle to the finish line. Ricciardo had such a great line on the inside of turn two but he couldn't make it stick into turn three, ran wide and lost the opportunity. Meanwhile, Rosberg has dropped the gap down to just 12 seconds before he catches this front-running trio. As the three approach a back marker, Lewis Hamilton locks up yet again. Ricciardo is ready to capitalise but can't do anything just yet. More lock ups for Hamilton into turn one, and he goes round the outside of turn two. This time he makes it stick into turn three ands gets the place. They also manage to navigate backmarkers successfully, leaving Ricciardo safely in second. Rosberg is just five seconds behind, and will close up on his teammate again. Down the home straight, Ricciardo dives to the side of Fernando Alonso and easily moves into the lead. Alonso's slowed right down now, it's only a matter of time before he loses second to Hamilton. The Ferrari looks a right handful as Fernando Alonso clings to the tiny amount of grip he has left. Lewis Hamilton is right there to capitalise but hasn't managed it yet. Meanwhile, Nico Rosberg has sped up to join the back of that battle. Ricciardo has pulled out almost five seconds ahead, leaving the battle for second far behind. Rosberg attempts a move round the outside of Hamilton, but just like Ricciardo earlier, runs slightly wide and can't do it. Daniel Ricciardo wins the Hungarian Grand Prix! 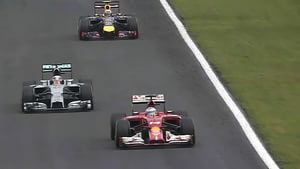 The three follow in the same order - Alonso slip-sliding his way across the line, an incredible drive from the pit lane for Hamilton in third, with Nico Rosberg having to settle for fourth after a great final stint. Big cheers from Daniel Ricciardo on the radio. "Absolutely amazing," Christian Horner responds. "You deserved that." Lots of cheers and air horns for all the drivers as they complete their slowing down lap. Fernando Alonso must be happy with a podium, it's much better than sixth place. Daniel Ricciardo hops out of the car, and punches the air as he makes his way to the weigh-in and then in towards the podium green room. A quick hug between Ricciardo and Hamilton, and hey, look, there's that trademark Dan smile. Sorry for the squish, but nothing to choose between Alonso and Hamilton across the line. 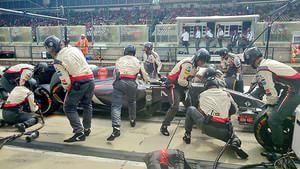 A good job for McLaren to squeeze tenth place out of what was a disastrous strategy call. Sauber disappointingly didn't get any points after showing potential midway through that race. To the podium they go, and the Australian national anthem plays out to the beaming smile of Ricciardo and a slightly exhausted-looking Red Bull crew. The trophies arrive, with Fernando Alonso also revealing a pretty big smile for second place. A fabulous display of defensive driving from the Ferrari driver. Lewis Hamilton's smile is more tempered, but when he looks back he'll see what a good afternoon he had. 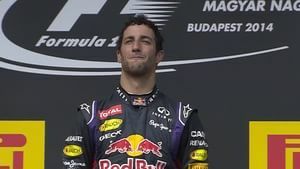 Podium interview - Daniel Ricciardo: "It feels as good as the first, it really does. The safety car at the beginning played to our advantage. I thought when the second one came out it didn’t really help us… had to pass our way through, that was a lot of fun those last few laps. I knew we had to make a move quick and the DRS was there, I knew it could have been my only chance. Took it and it paid off. Had to be done." Podium interview - Fernando Alonso: "Extremely satisfied, it’s been a tough weekend, a tough season in general. To get a podium is a nice surprise. We took a gamble, we risked today, trying to get the victory. We were close but extremely proud of the team, extremely proud of the job we did today but very, very happy. Today we had a combination of things that got the race difficult to execute, difficult to understand. We took our opportunities, our experience. We need some crazy races this year to get some podiums." Podium interview - Lewis Hamilton: "It’s been a pretty crazy weekend. Big thank you to the team, they did a great job with the pit stops and the strategy. I just tried my best. The car’s been fantastic when it’s going. A lot of points lost as we could have had a better weekend. To be honest, at the beginning, the brakes were very cold and locked up and I was gone. Fortunately I got going again, didn’t damage the car. Damage limitation." Podium interview - Daniel Ricciardo: "Definitely going to celebrate tonight. Party for a few days I think, enjoy a bit of time off. Then keep building on what I’ve done the first six months and look forward to Spa. I want to thank the team, they’ve really let me settle in so well. To grab two victories is phenomenal, really please. Got a few mates here this weekend, so we’ll party hard tonight." Tweet from @MercedesAMGF1: What a result for the crew too - up late into the night building that car and rewarded with a podium finish. Get in there! Nico Rosberg: "It was the first safety car came out at the worst possible moment. That hurt my race a lot because up to then it was going well. But things like that happen. Also strategy was not the right thing to do, but that’s the way it is. In hindsight it’s easier to say. I had a chance on the last lap, which was exciting but I’m annoyed I wasn’t able to make it happen. Lewis made a mistake in turn one which gave me a small chance but it didn’t work out." Also, when asked about the team orders controversy, Nico Rosberg said: "I didn't want it, the team informed me he was going to let me past. I don’t know what happened then, we need to discuss internally, that’s better." That's it for us heading into the summer break then - an incredible race to tide us over the next few barren weeks. Williams have unfortunately lost out to Ferrari in the championship again, but it's still a close fight between them with half a season still to go. The bitter battle between teammates at Mercedes continues, and goodness knows they could do with a bit of space from each other during these summer holidays. Fernando Alonso's podium may have cheered him up a bit, and given the team something of a boost, but it's clear all is not rosy at Ferrari this season. And thus, sad as it is, I must bid you adieu. 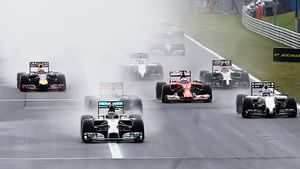 Formula One takes its traditional August break, with the next race in Belgium on the 24th. You absolutely must join me then as the second and final half of the season gets underway. Don't forget about me, fact fans!